Messengers of hope, we fly and sing to announce the arrival of the Green Man and the May Queen on Calton Hill. The Aerie have made their final group selection and are now closed. Throughout history, birds have been represented as the manifestation of the heaven’s will, as kind messengers, or harbingers of doom. The Aerie will explore this concept by offering to the witnesses a performance that would herald the coming of Summer, and the return of the Green Man. We are performance group that will focus its efforts into blending the use of noisemakers and dance in order to weave a narrative based on hope and renewal. We will also craft our own wings, and quite possibly masks. We’re ideally looking for group members with a keen interest in dramatic performance, be it musical or physical. But we’re at heart a very welcoming group and would be quite willing to help train newcomers, especially if they’re enthusiastic and have a good sense of rhythm. We also have room for a couple of helpers; bonus points for you if you know how to build props! Beasties have made their final group selection and are now closed. We represent the rising heartbeat of spring, the rushing of blood through your body, the quickening electric touch of a new lover. Some drumming experiance is advisable but not mandatory. Access to a drum is also a good idea. Bower have made their final group selection and are now closed. The hearth and home to which the procession returns from its journey. The Bower is welcoming, warming and nourishing. It is the village that awaits with hope the return of the heroes to embrace and celebrate their homecoming. We will be creating a space to fill with performance and joy. We will make things ranging from decorative banners and bunting to a Maypole and steel fire pits. We will find stories to tell. On Beltane night we will share our stories and our warmth with the audience and our fellow performers alike. We have fairly diverse roles available within the group – performers, makers, storytellers, ushers, and room for some folk who just enjoy making a good cup of tea. We will expect those with expertise to share these skills within the group, but we don’t need everyone to learn to do everything. We do not move around the Hill during the Festival and so are perhaps suited to members for whom mobility is more limited. Contact Point have made their final group selection and are now closed. A non-performance group that provides information and assistance to the public attending the festival. We will reflect the duality in all that surrounds us in the world, and within Beltane itself. We will be showing this duality in our physical forms, mirroring earth, air, fire and water, coupled with concepts such as light and dark, life and death, good and evil. Each pair of members of the group will pick a duality they wish to represent on the night when the veil between worlds is thin and the blurred lines between opposites needs clarification by our knowledge and guiding hands. We will be present to answer questions on the night, providing assistance to any audience members who need directions or information. Where necessary, we will assist the Stewards and generally be on hand to be helpful. We’re looking for people with an approachable demeanour and the ability to communicate the concepts and aspects of the performance clearly with total strangers. We will be on the Hill from the very beginning of the evening to the very end so good staying power will be beneficial. 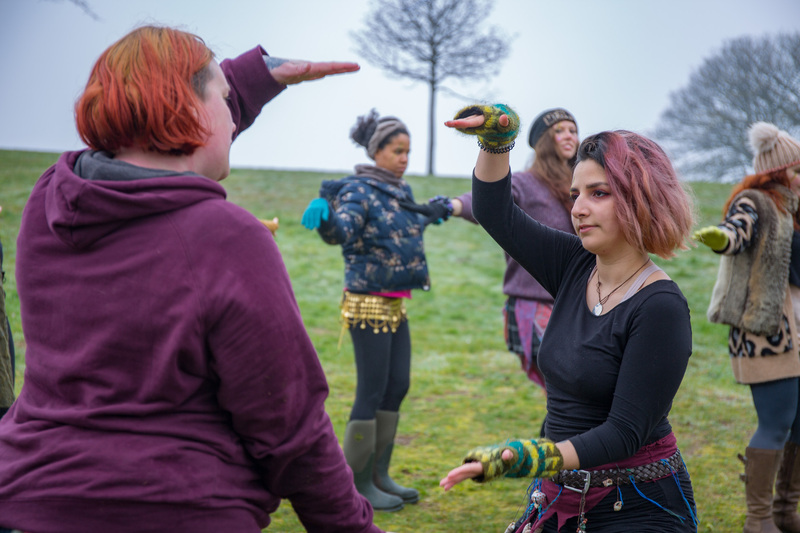 We will be meeting with other groups, holding sessions on the Hill and teaching our members about Beltane history so training and personal development opportunities are offered. Earth Point have made their final group selection and are now closed. The physical representations of the Earth’s seasons, from winter to summer, from dark to light; we move with the turning of the Earth. We represent the Earth in its elemental form. From winter to summer, from dark to light; we move with the turning of the Earth. We are physical movement group, focusing on elemental movement and dance. We will be exploring ways of moving with silks and other props, exploring the earth element and building a visually stunning performance. A reasonable level of fitness is required and we will teach you how to dance with ribbons and silks (think rhythmic gymnastics rather than aerial silks). Any experience of movement or dance is an advantage but we’re happy to encourage anyone who’s happy to learn. Faerie Porters have made their final group selection and are now closed. During the day, the Porters are spirits of place, linking the sites of Beltane and Samhuinn around Edinburgh in their travels; At night, we are spirits of time, adding to the celebration of the season with dancing and fairy revels. The Faeries are carrying our (toad)stools from the Grassmarket, home to the Bower, showing in our steps that Samhuinn links to Beltane, and both link to Edinburgh. And that coming home is cause for celebration! 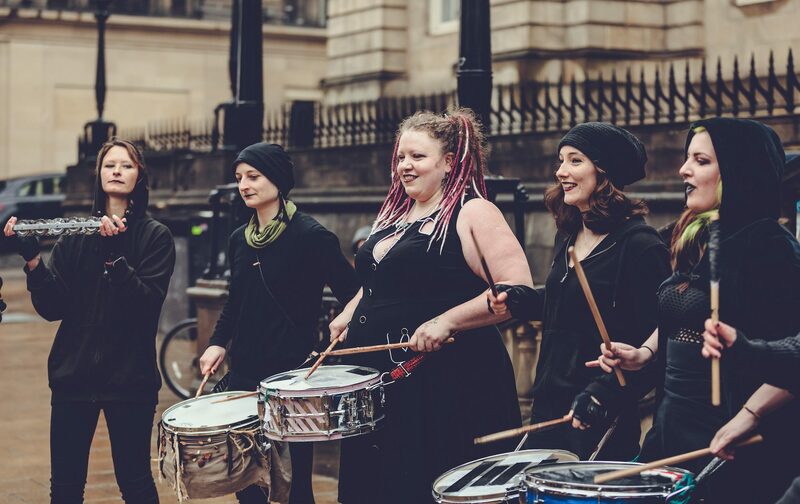 The Faeries wander the streets of Edinburgh in the daytime, bringing their belongings to the festival, then – after a rest – reclaim Calton Hill as the fairy dancehall and place of seasonal celebration. The daylight activities of the fairies need a willingness and ability to have (respectful) fun with the people of Edinburgh. The night-time activities of the group will be based around a traditional ceilidh; We need people who can play or dance, but are even more eager to meet people willing to learn alongside us! Our Faerie endeavours will span the day and night of the 30th April between noon and midnight! Fire Arch have made their final group selection and are now closed. The doorway of the spirit world into the physical world. Fire Arch are the guardians of the sacred space. We are powerful creatures embodying the destructive and sacred power of fire. We will be combining theater, choreography and fire spinning for our performance. So there will be lots of workshops on movement, character work and enhancing our fire toy skills. Some experience with fire toys would be preferred but we would also consider new people who are fast learners. We will be teaching movement, choreography and there will be ‘retired’ fire spinners from Beltane coming along to do fire spinning workshops with us. Fire Point have made their final group selection and are now closed. The fey custodians of the flame which is gifted to the May Queen. We represent fire as a catalyst transmutes things from one state to another. Our concept is to create a ritual-as-performance which will be the result of our group members imbuing their own meaning and symbolic significance into choreographed movement with fire. Our main activity is fire spinning with various toys, working towards a choreographed performance piece. We will also be doing group and character work. Experience in fire spinning is preferred but not essential; if you are enthusiastic and keen to learn we will teach you the skills you need! This will also be a highly choreographed performance group, best suited to those comfortable working in a group to a set routine. Nomadic Flame have made their final group selection and are now closed. The wandering flame seeking for a hearth to rest. We entertain the audience with demonstrations of our pyrotechnic prowess of large fire-based displays both active and passive. Our main activities are focused around building props and costumes of fire and testing them during interactions with other groups and on our own. We are imaginative, artistically and technically drawn. For people who want to build, perform and burn. Photopoint have made their final group selection and are now closed. Creating a high quality, permanent record of the festival and the preparations leading up to it through photography and video. Photo Point aim to help promote the Society and spread the joy of Beltane through our work. We hold photography workshops specifically aimed at preparing our members for photographing the Beltane festival. We photograph preparations leading up to the festival as well as the festival itself. Group members will require their own photography and/or video equipment. For still photographers we accept all skill levels and can teach the necessary skills, however videographers will need to be competent at video editing and at using their equipment in low-light conditions. Processional Drummers have made their final group selection and are now closed. 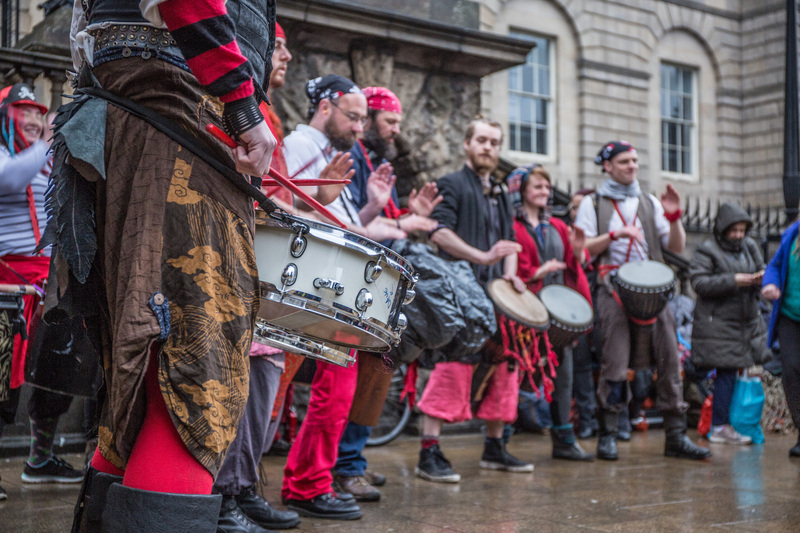 One of Beltane’s traditional drum groups, providing the procession with a relentless engine of dark, pounding rhythms. The Processionals focus on the idea of a drum group as a single impersonal entity – a machine made up of many unseen parts working together as a single powerful whole to serve the community. We hit drums. Then we hit drums some more. We are a high commitment group aiming to learn at least seven pieces over the course of ten weeks. No drumming experience is necessary, as long as you have a good sense of rhythm and are prepared to work on drumming skills in your own time. You don’t have to get in touch before coming to an open rehearsal – just turn up! If you have a snare drum, floor tom or bass drum from a drumkit, this would be really helpful as we don’t have many loaner drums. Reds have made their final group selection and are now closed. Fire, pure instinct and the unstoppable force of life. Reds are creatures of chaos, disorder and desire. They are the heart of the fire, wild unbound energy, life reborn from the Earth, temptation personified. But, if they don’t meet counterparts that can teach them form, their own force will consume them. The Reds must draw from all the energies on the Hill if they are to learn balance and avoid a path of self-destruction. Reds will use movement, character, vocalisation, fire and acrobalance to express their evolution and growth over the course of Beltane night. We are open to all levels of experience as we will be teaching all the requisite skills needed to personify Red. We are a high commitment, high energy and very physical group that will be working hard to push the limits of what we can achieve. The friendly human face of the Beltane Fire Festival. Stewards are fully recruited and are now closed. We work with the production crew, emergency services and the performance groups to make sure everyone has a safe and joyful Beltane. We are not a performing group but we will interact heavily with the audience, telling them about the significance of the celebrations and about some of the things they will see so that they can make the most of their experience. 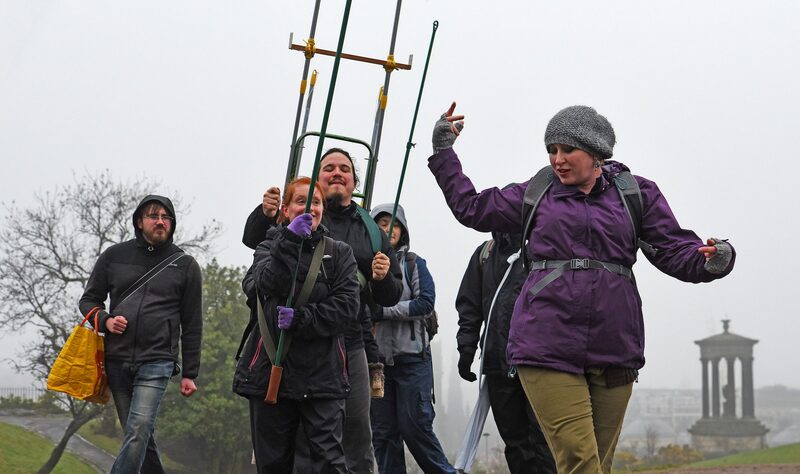 Our regular training meetings will normally take place on Calton Hill once a week on Sundays but the location and time of the meetings may vary depending on what other groups we need to practice with in the lead up to the festival. We’ll be playing games and building our confidence in holding spaces and working as a team, and we’ll also do some fire training. If you are keen to join us but can’t make all the meetings, talk to us anyway. We are a flexible group suitable for people with real-world responsibilities. The stage crew of Beltane. In the run up to Beltane we build fire sculptures and prepare everything to be taken to Calton Hill. The day before and on the day, we prep Calton Hill for the festival- building stages, fire sculptures, Hill decoration as well as setting up the fencing, crowd barriers, toilets and lighting. During the event, as well as looking after the safety of our audience and performers, we light the fire sculptures and fire the pyrotechnics. At the end of the event and on the day after we take it all down again. Torchbearers have made their final group selection and are now closed. Providing the light that allows the audience to see through the veil and witness the festival. Torchbearers are the physical representation of the veil between the real world and the fae world. We provide the light that allows the audience to see the performance and are a visual barrier between the audience and the performance. We light the Neid Fire at the beginning of the performance, then carry that fire using torches along the procession and into performance spaces in order to provide light for the festival. All experience levels welcome, whether you are new to Beltane or have performed in lots of festivals. Torchbearers will teach you everything that you need to know to be a Torchie (e.g. how to make torch balls, which are the fuel for the torches) and is a great introduction to the festival. Water Point have made their final group selection and are now closed. Fun enthusiasts for all things watery. Flow down the river with us on journey from source to sea, from winter into summer. Water Point will be a pic’n’mix sort of performance group, exploring acro-balance, brazillian dance, song, fabulous costumery, physical theatre and assorted malarky. We’ll also be getting outdoors a lot, drawing inspiration from the beautiful, watery world, and from each other. Unclog your brain-pipes. Get in a flow-state. Gush. Whites have made their final group selection and are now closed. Where true strength lies between duty and self. It’s been a long harsh winter and the Whites have aged with the burden of providing merciful death to the remnants of summer. Join us to find your inner light, you’ll need it on your journey as a White to protect the May Queen and reclaim your fertile youth. In our quest to bring forth life for spring, we will explore character, ritual and spiritual aspects core to the Beltane storyline using unified and individual movement, self-exploration and vocalisation. We’re a high commitment, high energy and active performance group. We’re open to all levels of experience as we will be teaching the skills to help you understand and embody White. The coming together of community to share stories, knowledge, inspiration and intent for the coming festival with transmission of our culture and togetherness at our core. We will be hosting a series of three or four (depending on demand and time availability) community events which employ the age old setting of a fire circle as a place to gather people together. All are welcome whether coming as a group or an individual – the event is focussed on sharing. The Community Fire is intended as a space to explore some of the themes of the Beltane festival in the run up to the night through storytelling, sharing of skills/group concepts or narratives and demonstration of some of the core ritual practices underlying the performance on the night. It is an open and safe space where people are encouraged to bring something to share which they feel is connected to the theme such as a story, poem, song etc. We are looking for individuals to come forward if they would like to help facilitate these Community Fires, though this is not a performance group and this does not exclude you from joining any other groups – any contribution is welcome. Are you a storyteller? A musician? Would you like to demonstrate traditional fire making techniques? Do you enjoy guiding meditations? An experienced member of the Society with our history to share? Are you someone who would take joy in nurturing those attending by baking a bannock or donating homemade drink to be shared within the ritual? Groups are welcome to use these events to showcase their focus skills if they would like to contribute. An email will go out prior to each Community Fire with the date, time and location included as well as a guide as to things to bring and a brief description of the theme of the evening and what to expect. There is also a Community Fire Facebook page which you can follow. Details will be put up there including related articles and resources. Family Beltane is a bright and beautiful Beltane celebration for children their families. We will be making arts and crafts, telling stories, face painting and having fun in the spirit of the wheel of the seasons and the celebration of the coming of the summer sun. This is a lovely introduction to young people to all the skills and traditions that we employ during the creation process of the annual night-time celebration of Beltane night. The event will be held at 1.30pm – 4.30pm on Saturday 23rd April 2016 at the Scottish Storytelling Centre, 43-45 High Street, Edinburgh, EH1 1SR. Offers of help and assistance are welcome. Please get in touch by email with ideas and inspiration!